Inspired by his 2015 trip to Selma, AL to commemorate the 50th anniversary of the 1965 Selma to Montgomery March, church member Manuel (Manny) Brown felt called to action. He was further inspired when he attended the Unitarian Universalist General Assembly (yearly UU convention) a few months later when our governing body urged UUs across our country to support the Black Lives Matter Movement. Upon returning to Seattle after GA, Manny approached church member Seth Hamilton about the idea of a group of East Shore folks standing on the corner in the Factoria area of Bellevue to support Black Lives Matter. And so it began. Soon they were joined by other church members and friends. “I stand on the corner every Sunday to bring awareness not just to the many black lives that have been lost and affected by continued police brutality, but also to remind people that systemic racism remains a problem in our country and each of us has a responsibility to help eradicate it,” says Seth. Since July of 2015, representatives from East Shore Unitarian Church have stood in solidarity on that same corner EVERY SUNDAY through rain or shine. The group has taken the name of the “East Shore Black Lives Matter Flash Stance.” “Sometimes people yell at us in anger, honk and wave in support, or avoid eye contact all together. It is important that we stand in solidarity to keep the conversation going,” says Manny. First Sunday Flash Stance in Bellevue: 11:30 a.m. to 12:30 p.m.
Join fellow Church members and other UU Churches in solidarity after Church service for a Black Lives Matter Flash Stance in Factoria on the corner by Dacell’s Jewelers. 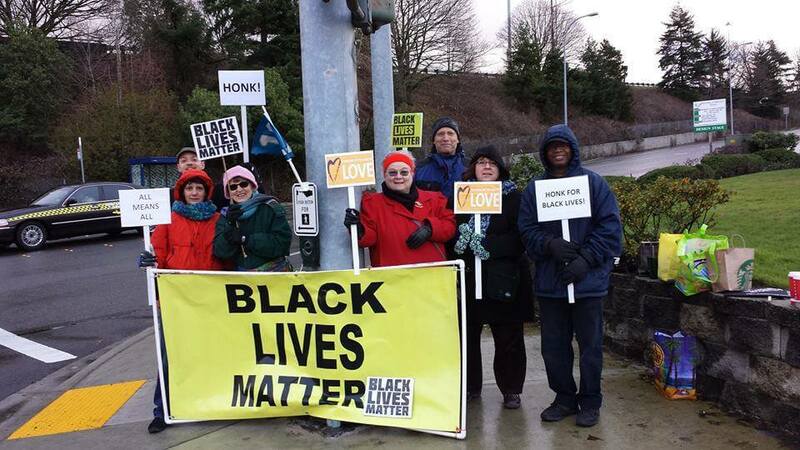 Second Sunday Flash Stance in Issaquah: 12:00 to 1:00 p.m.
Join fellow Church members and other UU Churches in solidarity after Church service for a Black Lives Matter Flash Stance in Issaquah at the corner of SE 56th Street and Eastlake Sammamish Parkway SE by the McDonalds. Fourth Sunday Flash Stance in Kirkland: 12:00 to 1:00 p.m.
Join fellow Church members and other UU Churches in solidarity after Church service for a Black Lives Matter Flash Stance in Kirkland at the NW corner of Peter Kirk Park next to the transit center.